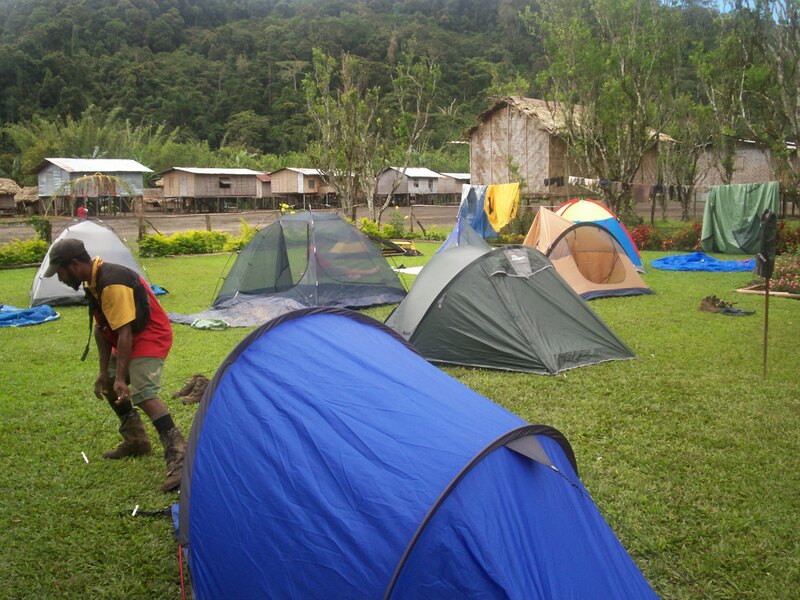 Kokoda Fast Treks are designed to give trekkers a challenge. These treks are fast paced and cover the 96km track in a shorter period of time than our other treks. If you are short on time or after a challenge then this is the trek for you. 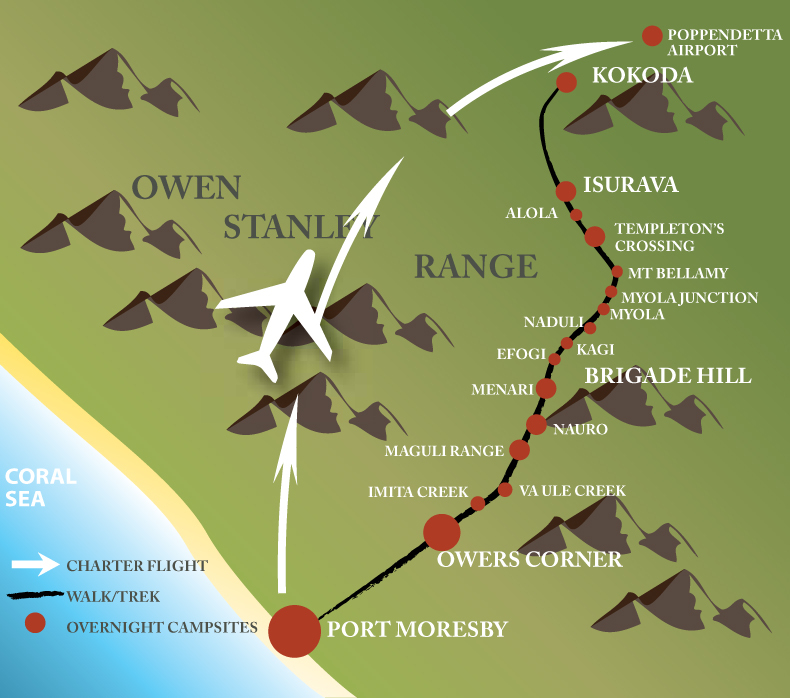 The Kokoda Fast Trek – Kokoda to Ower’s Corner are designed to give trekkers a challenge. These treks are fast paced and cover the 96km track in a shorter period of time than our other treks. If you are short on time or after a challenge then this is the trek for you. You will be start your trek at the Kokoda Station and take in a range of must see attractions including the War Museum and other historical memorials, the local hospital, the library, and other attractions in and around the local area. 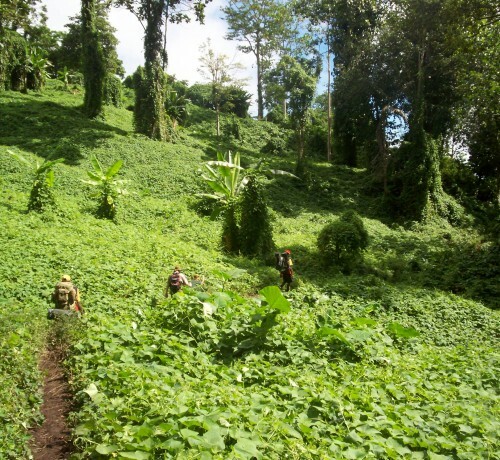 This is where we commence our trek, and after just an hour on foot, you will arrive at your first Kokoda village – the village of Kovelo. After a short stop, we will embark on another hour’s walk and soon arrive at the well structured and organised village of Hoi. It is in Hoi that you will begin to realise just how challenging this trek will really be. 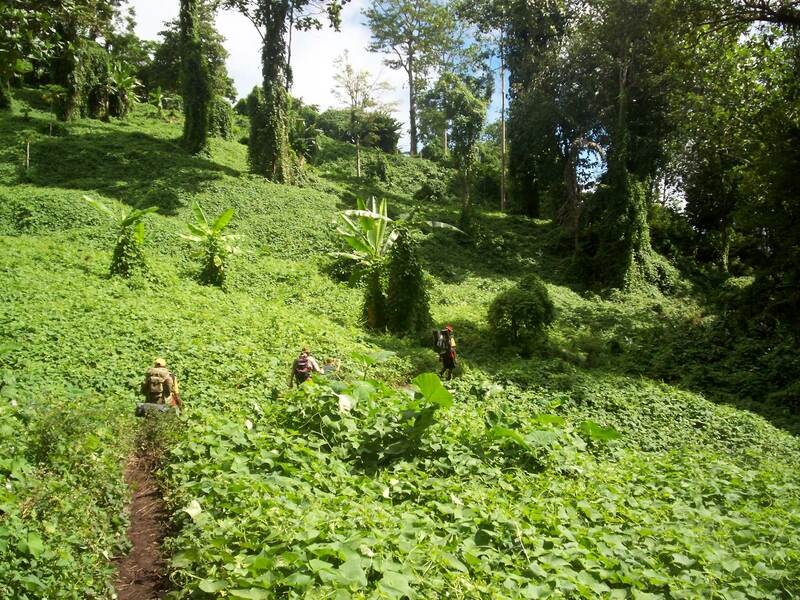 This part of the Kokoda Trail is not easy and presets you with a tough, steep climb in the beginning. But don’t be disheartened – this is just a test to get you in the mood, if you are not already raring to go. Another five hours on from here you will arrive in Isurava. 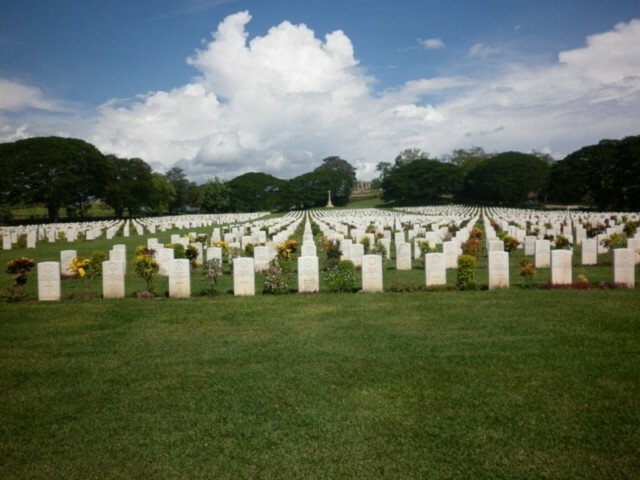 Isurava is home to a magnificent war memorial – opened by Australian Prime Minister John Howard in 2002 – and was the site of a significant World War II battle. Isurava is now regarded as one of the most sacred sites along the trail and is made all the more special by panoramic views of the Kokoda and Yodda valleys along the way. To rest your weary limbs after day one, you will stay overnight at the local guest house. After a restful evening, we set off early in the day, for our next destination – the village of Alola, and then move on to Iora Creek. Faced with a challenging and steep climb, and then a sharp descent, we finally reach Templeton’s Crossing which is where we spend the night. Imagine spending the evening under the forest canopy and falling asleep to the gentle voice of the Iora Creek splashing against the rocks? That will be you. And if you bring a line, you can also try your hand at trout fishing. Day Three sees your trek begin with another steep climb and descent – much like day two. With another crossing of Iora Creek, you will then climb to the top of Mt Bellamy, the highest point of the Kokoda Trail and take in the panoramic views of the area. You will be treated to a wonderful reward here – an enjoyable walk through a carpet of moss, which will take you to the junction of Myola and Kagi, which is land marked by an aircraft propeller. It is here that we will take a right turn, make a climb, and then descend to the splendorous village of Kagi. Kagi quite simply, commands spectacular views of villages along the Kokoda Trail and is a must see for trekkers to the area. We will continue with a walk to the airstrip, regarded as the steepest walk in the world, where we will descend to the creek, and then ascend to Efogi No. 2 village. If we turn back and look you will be able to see your trekking path from Kagi and it is at this point that we begin to make our descent into Efogi, where we stop for the evening and collect our food and supplies thanks to a prearranged food drop. Up early again and you will begin the day with a refreshing and challenging climb up to Brigade Hill. Brigade Hill, along with Isurava is one of the most sacred sites along the Kokoda Trail and having taken in this most beautiful area, you will then begin your descent to the village of Menari. As you continue along and then begin a further climb up a steep hill you will be taken in by summit as it presents you with fine views of Menari. Following this breathtaking moment you will make a muddy, swampy, and at times leech-infested (if you are lucky!) trek to the Brown River, which must be crossed with great care, especially if the River is in flood. Next take a walk onto the village of Nauro where we stop for the night to eat and rest, ready for day five. We begin our day by climbing the heartbreaking false peaks of Maguli Ridge (where you will even have time to count them yourself). After descending to Ofi Creek for a well – deserved break, we will then make another climb to Ioribaiwa Ridge, and a subsequent descent to Ua’Ule Creek for our last night together on the Kokoda track. the Goldie River. As a reward, we take one last refreshing dip in the River before climbing up to Owers’ Corner. Trekkers are then returned to hotel to end the trek.Congratulations! You and your fellow trekkers have just completed one of the world’s toughest treks. Along the trail, you have climbed nearly 5,500 meters (18,000 feet) and descended almost the same amount as you weaved in and out of some of the worlds most picturesque areas. You should be congratulated on your efforts. After all, you are one of an elite group to experience an adventure you will never forget.